With 2 key bases in the UK being Newcastle and London for the SIX TIMES OPEN twins, it only was natural to film their latest video challenges there and show physically the support that so many have shown them. 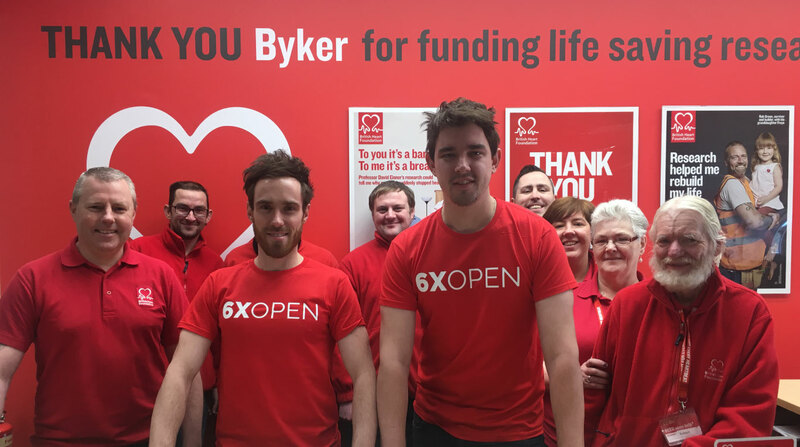 The team were greeted by a superb team of volunteers, managers and helpers at the British Heart Foundations flagship Furniture and Electrical store in the north of Newcastle. Assisted by manager Mark Howie, the team took over the store for over 2 hours, with filming taking place throughout. It seemed fitting for the twins to try their hand at shop keeping and for over an hour, they took over the shop desk and handled requests and enquiries. Having served a flurry of customers throughout the morning, the team enjoyed a group photo with all the staff present. We wish to thank Mark and the whole team for their kindness and encouragement as we take raising awareness of heart disease to a new level.